When the idea of adding mushrooms to beer comes up, I usually get one of two reactions. The first is “Eww, that sounds gross and disgusting.” The other one isn’t so positive! But mushrooms can add great flavor to certain beer styles, so get over your bad self and let’s talk fungi! I encountered the idea of using mushrooms in beer when I read my first homebrewing book, Randy Mosher’s Brewer’s Companion. He had a recipe for a wee heavy with chanterelle mushrooms that he called “Nirvana.” As if the name alone wasn’t enough to make me consider it, I live in the Pacific Northwest where chanterelles are plentiful. I had developed quite a taste for them, so I decided I had to try the recipe. I whipped up an extract-based wee heavy and followed the conventional wisdom about post-fermentation additions. I soaked the mushrooms in vodka and added that to the fermenter. It was one of those beers in which you could only taste the addition if you already knew it was there. I decided that for the next batch, I’d increase the amount of chanterelles to bump up the flavor. The problem was that you need to use a lot of vodka for two pounds (0.9 kg) of chanterelles. I found that so much booze added an undesirable “heat” to the beer. The quest was on. I had to find a new processing method! Now, nearly 20 years later, I’ve made numerous batches of homebrew with various types of mushrooms. I’ve learned how to think about the beer I want to brew and how to choose and process the mushrooms that go into it. 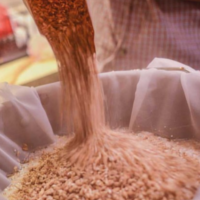 So, grab a beer, get over your preconceptions, and get ready for a truly unique and delicious ingredient for your homebrew! Those are words I never thought I’d type, but it’s really the key to the whole thing. 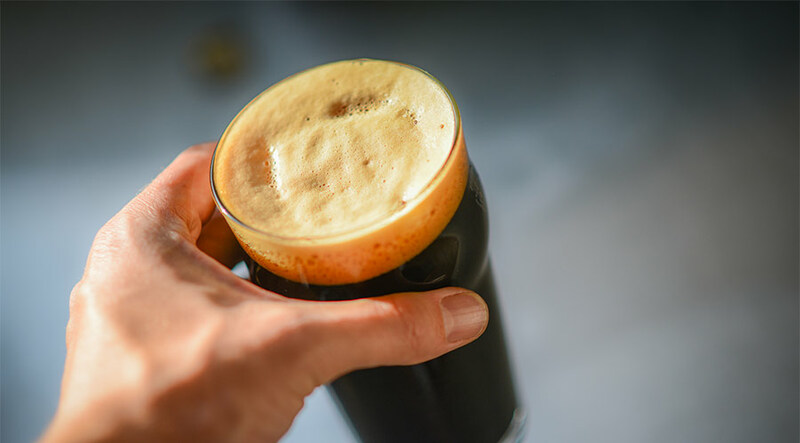 Not every ingredient—mushrooms included—belongs in every beer style, so you need to think about what the mushrooms will bring to the flavor party and what beer they’ll work best in. Chanterelles add an apricot-like flavor that enhances the maltiness of a wee heavy. 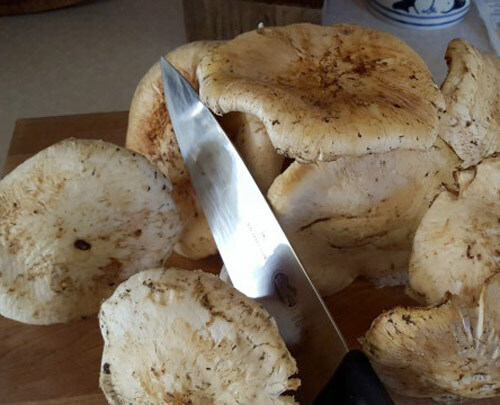 Matsutakes add a bit of funk to a Belgian golden strong ale (BGSA). Portobellos add a deep, earthy richness to an American brown ale, and candy caps are wonderful in a chocolatey porter. Who woulda thought! One thing to be aware of, though, is that the mushroom character will change when you add them to alcohol. Chanterelles lose their earthiness. Matsutakes, which are often described as “red hots and dirty socks” (yum! ), lose their spiciness, and the funk is toned down. Portobellos become less earthy and more rich, and candy caps become even sweeter. So you need to make a guess as to the underlying character of the mushroom and the style of beer it will work with. One way to get a rough idea of what will happen is to sauté up some mushrooms. I usually do this without any fat so that the true mushroom character comes through. When I tried that with matsutakes, for instance, I found that the mushrooms themselves were so strong that they just weren’t enjoyable to eat. But the exercise did give me an idea about the essential character of the mushrooms, and I determined that a BGSA would be a great vehicle for them. One last word about mushrooms: some can be quite expensive. It’s not unusual to see chanterelles for upwards of $25 a pound ($55 per kg). Matsutakes can even run as high as $300 to $400 a pound ($660 to $880 per kg). I’m fortunate to live in the woods where mushrooms grow. I can walk out my back door onto my wooded property and pick my own chanterelles most years. My neighbors are commercial mushrooms hunters, and they bring me many others. But, please, please, please, if you don’t know about mushrooms, don’t try to pick your own! Either go mushroom hunting with someone knowledgeable, or buy your mushrooms. This beer uses a couple of different experimental techniques. One is the boiling down of a gallon (3.8 liters) of first runnings to a thick syrup, then adding it back to the main wort to enrich the flavor. The other is the treatment of the mushrooms. One often soaks post-fermentation additions in vodka to make a tincture to add to the beer, but I found in my trials that vodka introduced a harshness that clashed with the beer’s otherwise smooth, malty character. So I just add the mushrooms themselves instead! With the beer’s high alcohol and low pH, and with freezing the mushrooms, I have never had a problem with an infection from mushrooms. If you’re a worry wort (pun intended), you can give the chopped mushrooms a very light spray of Star San, but make sure they aren’t wet going into the freezer. So, with thanks to Randy Mosher for the idea and Scott Abene for the wee heavy recipe, here’s Wee Shroomy. Mash for 90 minutes at 154°F (68°C), vorlauf until free of grain pieces, then run off wort to boil kettle. 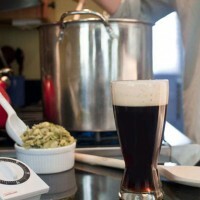 Remove 1 gallon (3.8 liters) of first runnings to a separate pot and boil down (see “First Runnings Boil-Down” below). Boil for 90 minutes. You can add the wort previously removed for the boil-down at any point during the main wort boil. After knockout, cool wort to 55–58°F (13-14°C). Pitch decanted yeast starter. Aerate well with the method of your choice. This is a high-gravity beer, and aeration is crucial to good fermentation. Ferment at 55°F until final gravity is reached. This could take 2–4 weeks. When final gravity is reached, add 2 lb. (907 g) of prepared chanterelle mushrooms (see “Mushroom Preparation” below) to a sanitized secondary container and rack the beer onto the mushrooms. Leave the mushrooms in for 2 weeks, then transfer the beer to another container for cold conditioning. Condition at 35–40°F (2–4°C) for at least a month. Keg or bottle to a moderate carbonation level, approximately 2–2.5 volumes (4–5 g/L) of CO2. For the boil down, remove 1 gallon (3.8 liters) of the first runnings to a separate pot. Boil until the wort is reduced to a quart (0.9 liters) or less. It should almost be a syrup by the time you get done. Add to the boil kettle during the main boil before chilling the wort. Thoroughly brush the dirt off 2 lb. (907 g) of chanterelle mushrooms. Avoid washing them, but if you must, use as little water as possible. Roughly chop the mushrooms. At this point, you can give them a light spray of Star San if you wish, but make sure the mushrooms are very dry. Put them in a vacuum seal bag, seal it, and freeze the mushrooms for at least a week. Remove the mushrooms from the freezer at least a day before adding them to the beer. Put the mushrooms and any liquid in the bag in a sanitized secondary container and rack the beer onto them. As I said before, I went through a learning process when it came to using the mushrooms. After deciding that the vodka soak just didn’t get me what I was looking for, I started playing with other methods. One thing that had always worked for me with fruit was vacuum sealing the fruit, then freezing and thawing it before I used it. That breaks down the cell walls of the fruit and lets the juice come out more readily. Trying it with mushrooms worked pretty well. When I thawed the ’shrooms, there was a bit of juice in the bottom of the vacuum seal bag, and a quick taste revealed that’s where most of the flavor was. 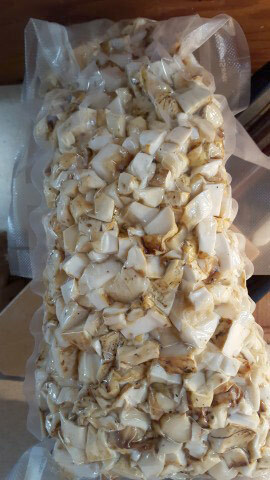 To get even more of that flavor elixir, I chopped up the next batch of mushrooms before vacuum sealing and freezing them. That certainly got me more liquid but also created a problem. I had washed the mushrooms and sprayed them pretty heavily with Star San in order to sanitize them. I mean, they had just come from the woods and were covered with dirt, pine needles, and who knows what kinds of microbes. What sane homebrewer wouldn’t do that? Unfortunately, that diluted the flavor and all the liquid made it really hard to get the vacuum bag to seal. It was obviously time to do something insane, something that no homebrewer would ever do. I left the mushrooms unwashed and unsanitized! Blaspemy! I told myself that the alcohol content and low pH of the beer would protect it. I would simply wipe off the surface dirt and hope for the best. It was a wild bet, and I won! I have now used this method dozens of times and have never had an infected batch. 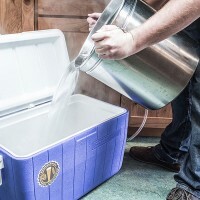 I realize that this is anathema to most homebrewers, so if you can’t bring yourself to try it, here’s an alternative. After you chop the mushrooms, spray them very lightly with Star San. Other sanitizers such as iodophor work great, too, but require a longer contact time. While I love iodophor for fermenters and yeast starters, Star San is a better choice in this case. Just brush off the dirt (no washing! ), chop, spray, and vacuum pack. 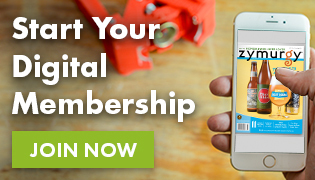 The other thing you’ll have to decide is how much to use for a batch. For chanterelles in a wee heavy, I find that you want about half a pound per gallon of beer (60 grams per liter). 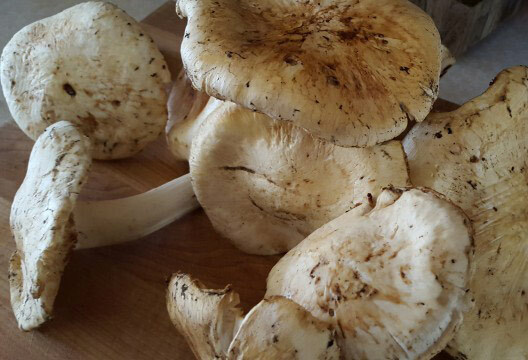 Three and a half pounds of matsutakes in a 5-gallon batch of BGSA (1.6 kg in 19 liters) will give you a subtle flavor. Seven pounds (3.2 kg) will leave no doubt about the earthy, funky flavor. For both portobellos and candy caps, anywhere from 0.5 to 1 pound per gallon (60 to 120 grams per liter) works great. Mash for 90 minutes at 150°F (66°C), vorlauf until free of grain pieces, then run off wort to boil kettle. Add sugar and boil for 90 minutes. After knockout, cool wort to 62–64°F (17-18°C) and pitch yeast. Aerate well with the method of your choice. When final gravity is reached, add the prepared matsutake mushrooms to a sanitized secondary container and rack the beer onto the mushrooms. Leave the mushrooms in for 2 weeks, then transfer the beer to another container for cold conditioning. Condition at 35–40°F (2–4°C) for at least a month. Keg or bottle to a moderate carbonation level, approximately 2–2.5 volumes (4–5 g/L) of CO2.